Think beyond Darden's real estate to determine if long term value is present. Both the activists and Darden provided incomplete analysis. 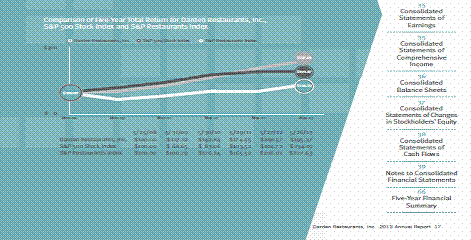 Restaurant level EBITDA is a poor metric; free cash flow metric is better. Watching the ongoing war between the Barington and Starboard activists that have stalked the Darden (DRI) casual dining giant since late 2013 has been like watching a tennis game where the two players volley consistently in the air above each others heads. The value of Darden's real estate is the real objective and no one is making the points properly. Imperative for Investors: Ask for more information. Think: do I want my bonus now or later? Does divesting real estate do anything to fix the fundamental issues at Darden? The real essence of the Darden real estate argument hasn't been laid out by either side well, and a lot of analytical foundation is missing. Look beyond the initial real estate splash to assess long term value. Darden owns and operates eight casual and upper end fine dining brands. For years it was on a strict 15-20% EPS target. It didn't franchise and until very recently was only US and Canada focused. As the US filled up with restaurants, and as casual dining sales growth began to slow down for many reasons in 2006-2007, it struggled to extract enough pennies and free cash flow to both remodel and execute buybacks and a rich dividend payout. Darden was sued in 2009 for a SEC 10b5 claim of unreasonable earnings claims coming from the RARE acquisition, but the Orlando Federal Court dismissed the action in 2009; given the high bar to securities litigation initial motions in the era after the 1995 Litigation Reform Act. Full disclosure: I worked a special investigation of Darden's earnings projections after the RARE acquisition and didn't see how then how the acquisition synergies were "reasonable". DRI's stock performance lagged in 2012 and 2013. · Spin off the owned restaurant real estate into a REIT or sell the underling land. While they weren't operators (Barington had some experience with the now fading Lone Star Steakhouse and the Pep Boys auto oil change chain as investor), they could read balance sheets and saw the company owned a lot of store real estate. Owning real estate was a restaurant financing and development strategy. In the early days it provided a veneer of security for the bankers but it also provided for a great mode of control: there were no landlords to hassle with, no step rent increases in the outyears or costly lease terminations should a site have to be closed. Working restaurant litigation matters as a one element of my consulting practice, I can testify that among the most common are real estate disputes. In conference calls, Darden said that its Specialty Restaurant Group was profitable and could stand on its own. That was a bad admission, because almost certainly, that profit basis was an EBITDA value and not a free cash flow basis, which would have covered the CAPEX and debt service cost to build $5 million boxes. Restaurants don't highlight that metric. 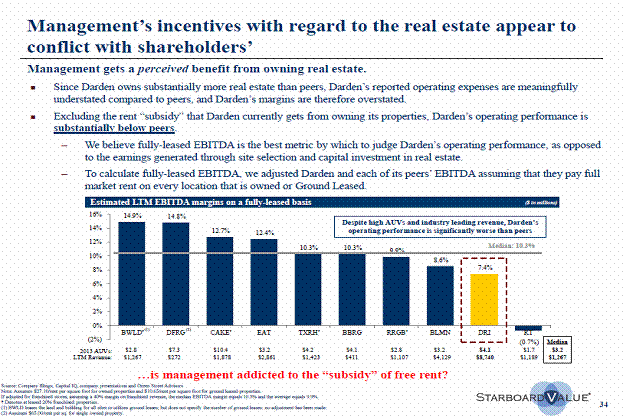 Barington and Starboard have endlessly speculated on what a Darden REIT could trade for. Of course, there are no restaurant REITS to provide comparables. See the following video from Howard Penny of Hedgeye, supporting Starboard and his super long call on Darden. Note that he touts the potential value of the REIT. 1. What is the projected free cash flow profile for the outyears for a separated Olive garden/Red Lobster, and Specialty Restaurant Group? 2. 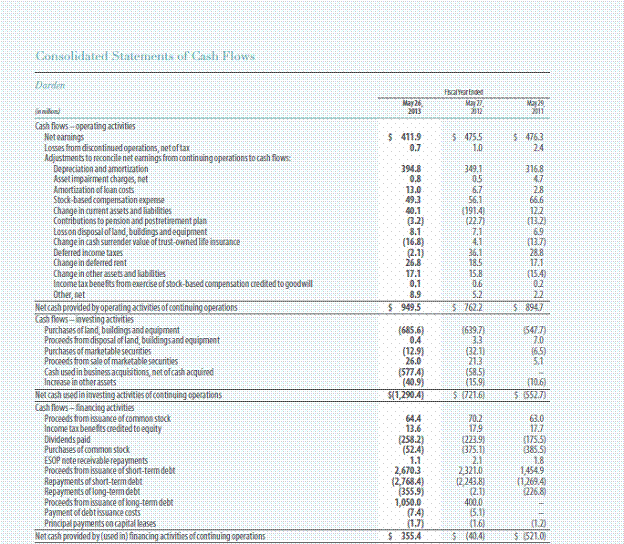 What is a realistic REIT cash flow profile for some crappy real estate that Darden owns and needs to get out of? How much will Darden be liable in payments to the REIT? McDonald's (MCD) and Tim Horton's (THI) also are real estate centric, for the control and for the potential for real estate margin. Once the property is paid for, then it's practically a 100% profit flow through. As Jonathon Maze, Editor of the Restaurant Finance Monitor pointed out recently, "restaurant executives tend to take a longer view of real estate. It's a safety value; providing the company flexibility with options should things get bad." The activists want short term gain, as does Wall Street generally. They tend to talk about "unlocking value". But over what time? Not many contemporary restaurant chains have such real estate intense balance sheets, as restaurant construction and land costs both rose in the 1990s-2000s. Memo to Starboard: any EBITDA metric is a very poor metric to judge performance. 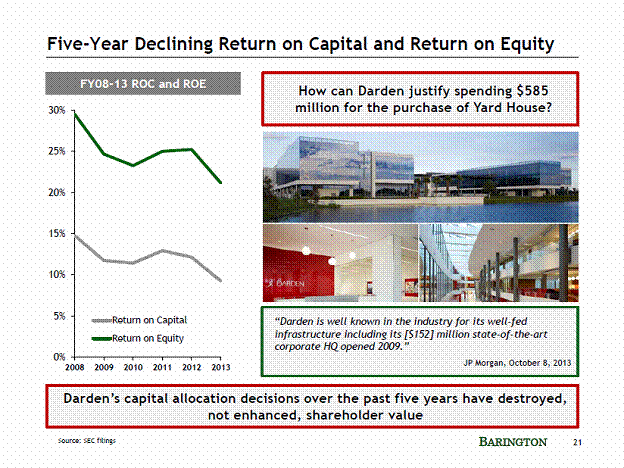 (1) Will the decoupling of the real estate fix the problems at Darden? (2) What will you, Darden, do for me tomorrow? The answer to Question One is almost certainly not. In fact, losing control of the real estate to either a REIT or a landlord owner should make it more difficult to reposition either Red Lobster or Olive Garden. Population and retail/restaurant trade patterns shift in the US, and there are too many casual dining restaurants now. That is one of Red Lobsters and Olive Garden's realities that Darden failed to address. While the land has value forever, many restaurant sites have an effective peak economic life of 20-25 years. In terms of Question Two, it seems not clear. The activists have failed to lay out future year cash flows with and without real estate rents, and with and without portfolio breakage. They are talking the REIT valuation in one hundred page detail, however. Wrong entity to think about. Can Darden really close stores and not be stuck with big lease make whole payments? Darden hasn't laid it out clear case either. If it's a church or a dollar store that comes in to backfill some closed Darden sites (two of Darden's closed sites in Indianapolis are that), think about being disappointed, either in the REIT, or decreased cash flow from Darden's core business.